Making Tax Digital (MTD) goes into effect in April 2019, and this landmark reform will change the way millions do business in the UK. Companies above the VAT threshold of £85,000 must submit VAT returns using MTD-compatible accounting software. HM Revenue and Customs (HMRC) aims to make tax administration more effective, efficient, and easier for taxpayers with this fully digitised system. With their help, this first VAT submission came just weeks after being listed on the HMRC’s website as software that supports MTD for VAT. With Zoho Books, businesses can do their accounting while maintaining a digital copy of their tax records, and push quarterly VAT returns to the HMRC with ease. 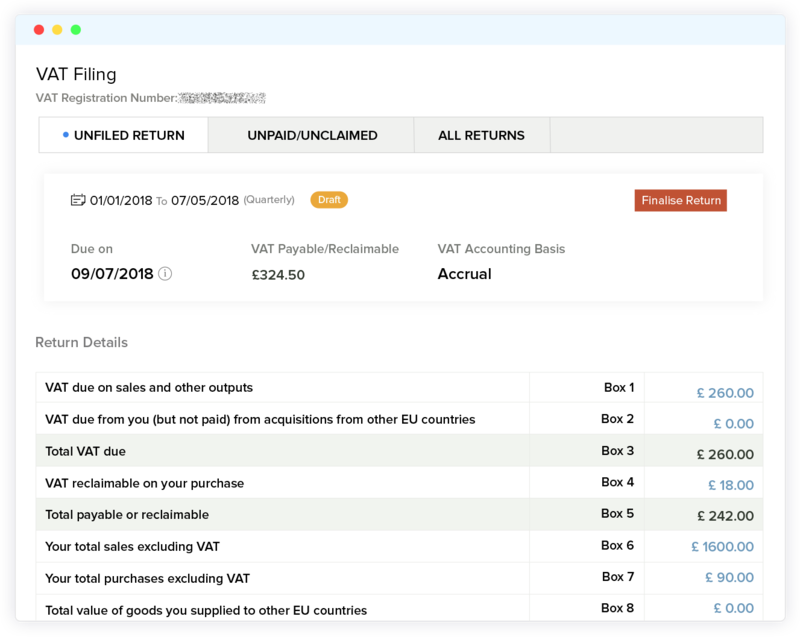 Outside of the newly added VAT filing, other MTD features were already available to existing Zoho Books users to help them stay ahead of the curve. Continuous engagement with HMRC and interactions with experts further helped the team bring the software in line with these requirements. Here’s a complete breakdown of all our MTD-related features. MTD mandates recording transactional information digitally in an online account. With Zoho Books already in the cloud, it acts as a single repository to store company details, transactional values, and VAT returns. 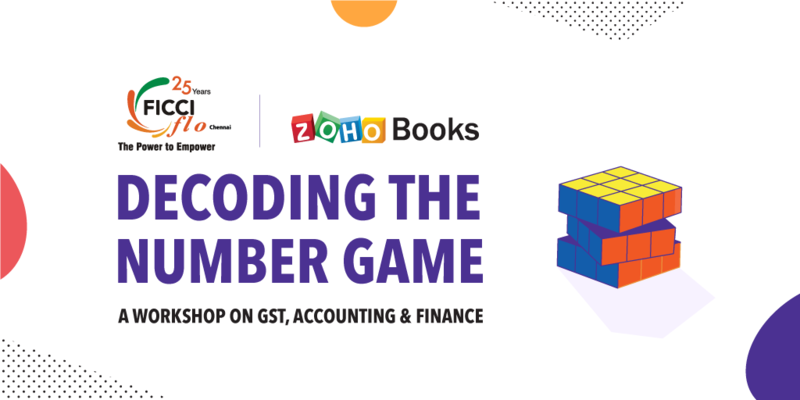 Zoho Books automates the recording of money coming in and out of the business. With bank feeds and receipt scanning, companies can steer away from the grueling tasks of data entry. Invoices created using Zoho Books hold the essentials of any transaction, like the supplier’s address, VAT registration number, place of supply, VAT scheme, and VAT amount. 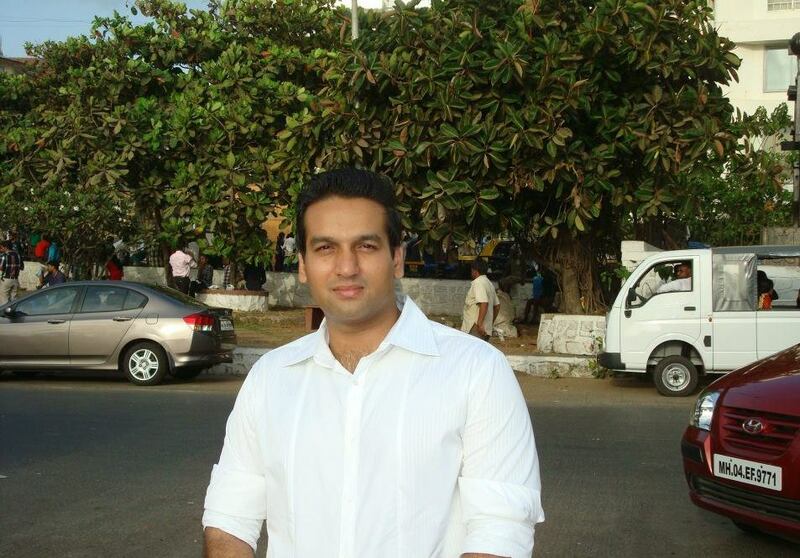 Zoho Books generates reports to help businesses take informed decisions. This includes reports on VAT returns, VAT MOSS, and European Commission Sales List. As mentioned in VAT notice 700/22, MTD requires data to flow digitally between multiple applications and mandates them to work in conjunction with a compatible accounting package. Zoho’s connected suite pushes transactions created in its CRM app, expense app, or any of the other 40+ apps, seamlessly into Books, ensuring unbroken MTD compliance. 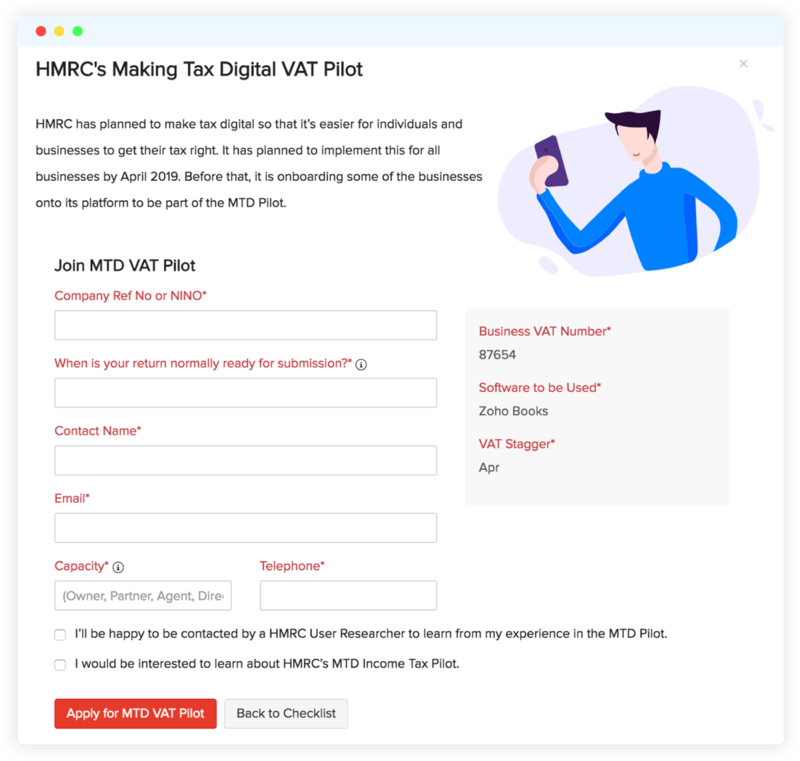 Under the pilot testing programme, we’re enabling beta filing for businesses who have disabled international trade within Zoho Books, Just fill out the form that pops up and, once approved by the HMRC, the transition starts with onboarding and then VAT filing. The functionality will be opened to all at a later date. Submitting VAT returns to HMRC with Zoho Books is just a three step process—generate, validate, and submit. Let’s get into the nuts and bolts of the process. Click VAT filing from the modules listed on the left. 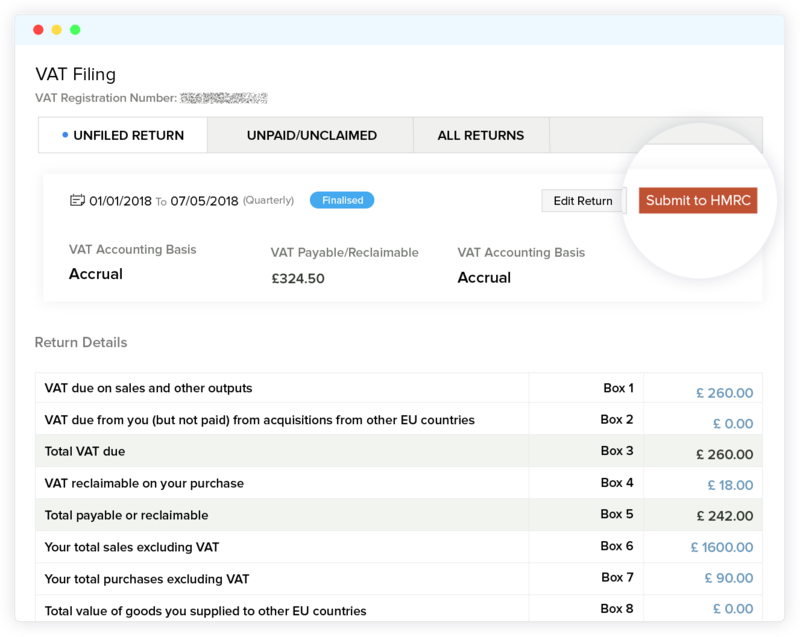 From the sales and purchase transactions, Zoho Books automatically computes the VAT return for the time period. Assess the values populated in the report before submitting the returns. In case of any discrepancy, Zoho Books lets you edit returns to ensure that the numbers submitted are error-free. Click Finalise Return to freeze the returns for the time period. When the data is reviewed and finalised, push it to the HMRC portal directly from Zoho Books, with the click of a button. Businesses meeting HMRC’s criteria are eligible for beta VAT filing now. Register for the Zoho Books pilot testing programme and file your first return on the way to becoming MTD compliant. 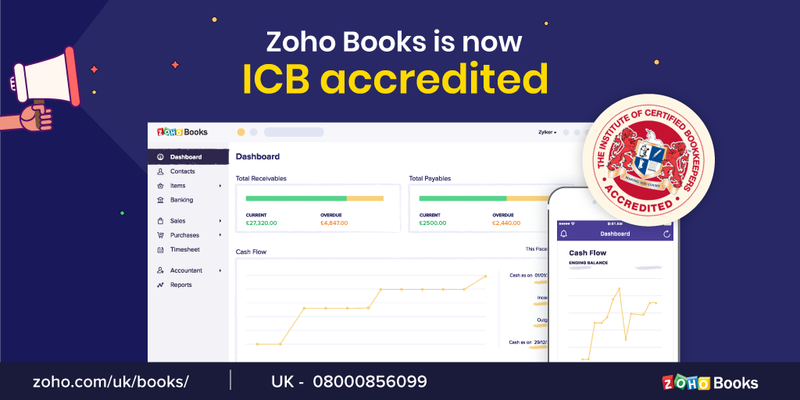 Zoho Books will continue working closely with HMRC, accountants, and small business owners over the coming months as part of its ongoing commitment to delivering a best-in-class experience for individuals and organisations that file tax digitally. If you have questions, leave a comment below or send an email to support.uk@zohobooks.com.